FIGURE 5-37 Model of TSHR with the TSH site and the TSHRAb epitopes defined in a three-dimensional array. Determinants for blocking TSHRAbs (TSBAb) and stimulating TSHRAbs (TSAb) are approximated to compose the TSHR site. The former are implicated in the expression of disease by patients with idiopathic myxedema and hypothyroidism; the latter are implicated in patients with Graves' disease and hyperthyroidism. They are presumed to comprise the high-affinity TSH-binding antagonist site and the agonist site for TSH, respectively, on the basis of the competitive antagonism or agonism of TSH with monoclonal inhibiting and stimulating receptor antibodies. The loop between residues 303 and 392 is X-marked and separated from the remainder of the external domain since residues within it can be deleted with no loss in receptor function. This loop includes residues 352-366, which comprise the immunogenic peptide used to produce a specific antibody to the receptor. The immunogenic peptide is approximated near the blocking TSHRAb site because immunization with it or an adjacent peptide can produce blocking TSHRAbs that do not inhibit TSH binding and because they can, with time, produce antibodies reactive with peptides containing residues identified as blocking TSHRAb and high-affinity TSH binding. The model does not preclude the possibility that other sites contribute to the TSHR site, i.e., residues that react with peptides common to TSH binding using TSHR peptides. These are presumed to lie within residues 200-285 in particular. We identify cysteines that are (open circles) or are not (bold circles) likely to affect tertiary structure. The two cysteines on the exoplasmic loops of the transmembrane domain are assumed to carry the conformational signal of the receptor-ligand interaction with the extracellular domain of the receptor; it is possible that these cysteines are also involved in ligand binding as proposed in adrenergic receptors. The third intracytoplasmic loop, particularly alanine 623 but also its five N- and C-terminal residues, is identified as the critical link for hormone and TSHRAb coupling to a G protein important for signal-transducing activity, leading to the phosphatidylinositol biphosphate cascade. It also interacts with Gs, but only regulates constitutive or basal cAMP levels. 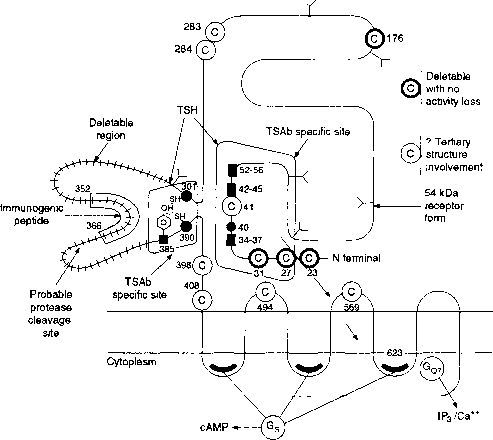 Intracytoplasmic loops 1 and 2 are presumed to be coupled to Gs. The figure further delineates possible mechanisms for coupling to G proteins. Reproduced with permission from Kohn, L. D., Ban, T., Okajima, F., Shimura, H., Shimura, Y., Hidaka, A., Guiliani, C., Napolitano, G., Kosugi, S., Ikuyama, S., Akamizu, T., Tahara, K., and Saji, M. (1995). Cloning and regulation of glycoprotein hormone receptor genes. In "Molecular Endocrinology" (B. D. Weintraub, ed. ), pp. 133-153. Raven Press, NY. action may involve phosphorylation of the receptor itself in addition to the other proteins that may play a role in the availability and movement of cholesterol into the mitochondria of the ACTH target cell (Figure 5-37). The gene for the human ACTH receptor has been expressed in COS cells, and these cells become responsive to ACTH in a dose-response relationship measured by cellular levels of cyclic AMP that is reminiscent of the binding of ACTH to the receptor. Thus, in cells transfected with the normal ACTH receptor, the cells respond to 10"9-10"8 M ACTH by a 5-6-fold increase in cyclic AMP production. Interestingly, a syndrome of familial glucocorticoid deficiency requires 10 times the normal concentration of circulating ACTH to be effective. This disease is now explainable in terms of a mutation of Ser741 in the ACTH receptor, which produces a receptor that is less efficacious in its interaction with ACTH. The ACTH receptor is part of a subfamily of G-protein-linked receptors in which the MSH receptor is a part. This subgroup is distinguished by their small size in comparison to other G-protein-coupled receptors and they consist of 297-317 amino acids. These receptors have short N-terminal extracellular domains, short C-terminal intracellular domains, and small second extracellular loops. Some amino acid residues characteristic of other G-protein-coupled receptors are also lacking in this subfamily. This family of receptors is shown in Figure 5-38.